Jazz Composer's Collective and Fay Victor's Herbie Nichols SUNG. much to everyone involved and to those that get to view and hear these performances in the future. tributes to his sorely neglected legacy coming from artists like Misha Mengelberg, Roswell Rudd, Duck Baker and more. Nichols also inspired a repertory project called the Herbie Nichols Project, and most of his recordings were reissued on CD. aspect of Herbie Nichols' legacy. Best wishes to you all! Thank you so much for your donation to the Herbie Nichols 100th Birthday Celebration at the Stone! It was a great success and your donations contributed to the filming of the al four days, an ad in the New York Jazz Record to spread the word a few other incidental expenses. The performances were wonderful and well attended by folks of all ages. I couldn't be happier with the results of the celebration and how good everyone felt hearing Nichol's played so many different ways. Please let me know if I can forward the you tube links of the concerts to your attention! 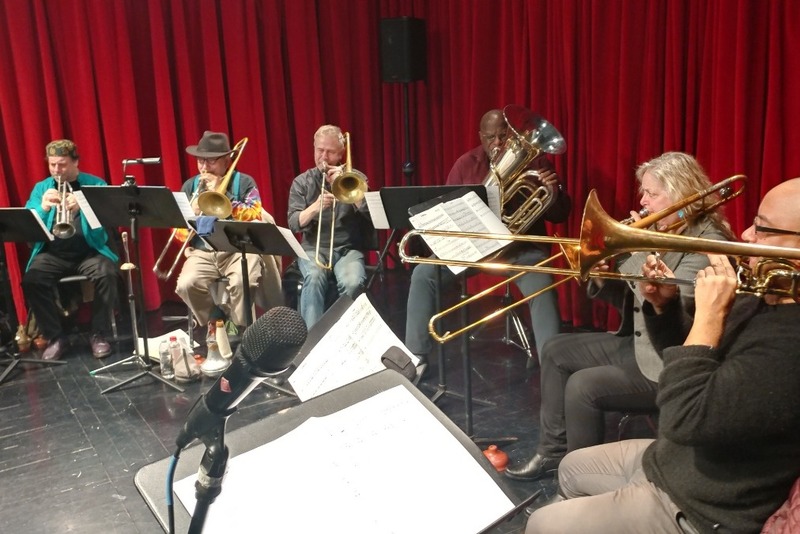 I'm sharing a picture with you all one of the most powerful and touching evenings - listening to Roswell Rudd's Trombone Tribe perform Herbie Nichols' music as a group for the first time. It was a premiere and many in the group contributed arrangements for the performance as well. This evening was not only a tribute to Herbie but to Roswell Rudd as well, who not only knew and performed with Nichols personally, he also became one of Nichol's biggest advocates through recordings, performances and the book of unpublished works of unrecorded Nichols' compositions known at that time.